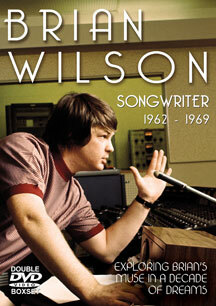 A review of the Brian Wilson's songs of the 1960s. Brian Wilson Songwriter 1962 - 1969 is a documentary film in which the rich tapestry of music written and produced by this brilliant 20th century composer is investigated and reviewed. With the main feature running at over three hours in length across two discs, the songs Brian wrote for and recorded with The Beach Boys during the 1960s are here re-assessed.